Back in the Summer of 2015 we shared photos and behind the scenes details of a Maine family playhouse under construction. After a great deal of hard work, we’re pleased to share that the whole family and many of their friends were finally able to relax and play in their new vacation house! 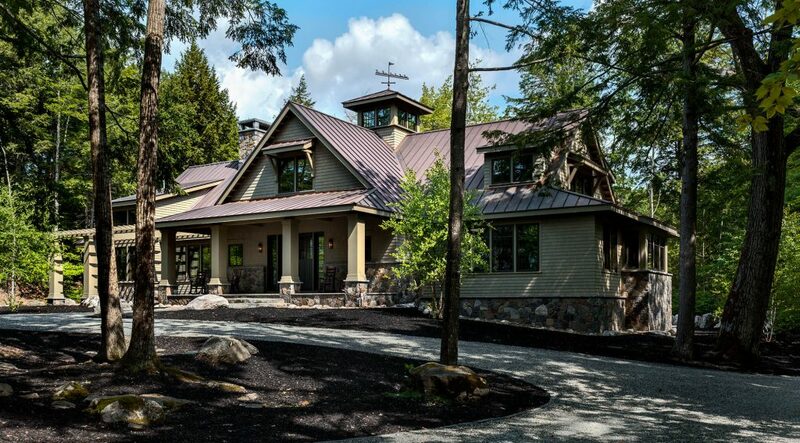 Take a look inside… Reminiscent of an old time New England summer camp, this newly constructed playhouse is situated on a secluded lake in the Maine woods. Our clients’ vision was to create a special place for generations to come, with enough space to host up to thirty guests and ample opportunities for summer fun. Foyer with whimsical balloon chandelier. 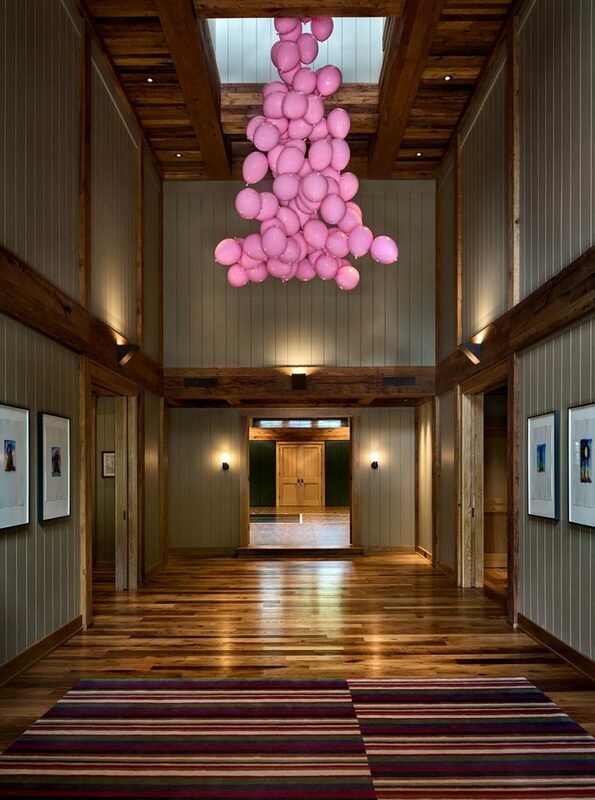 The home’s playful spirit is evident immediately upon entrance, where a balloon art sculpture seems to float up into the cupola, as if they were just released by a child. A variety of art adorns the foyer walls for the guests’ viewing pleasure. The home is packed with activities that adults and children alike can enjoy. 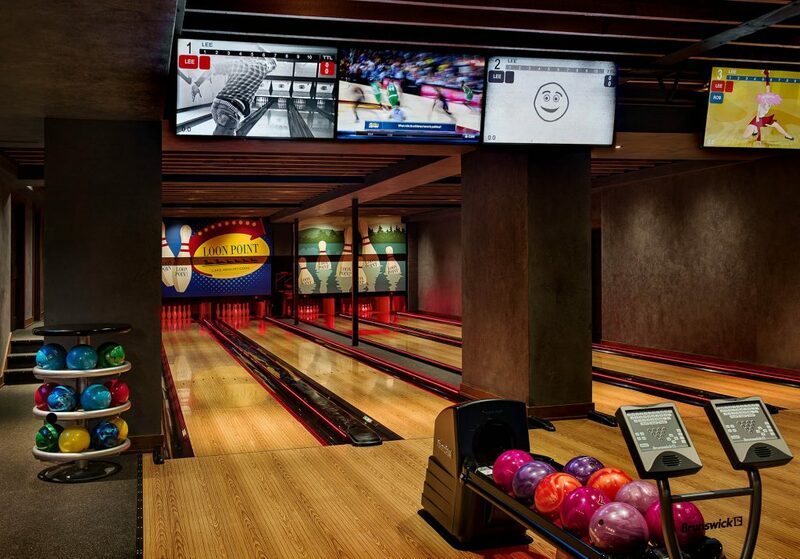 This industrial-chic bowling area was inspired by the owner’s children’s favorite alley back at home, and comes complete with two 10-pin lanes, two duck-pin lanes, a lounge and (of course) a snack bar. 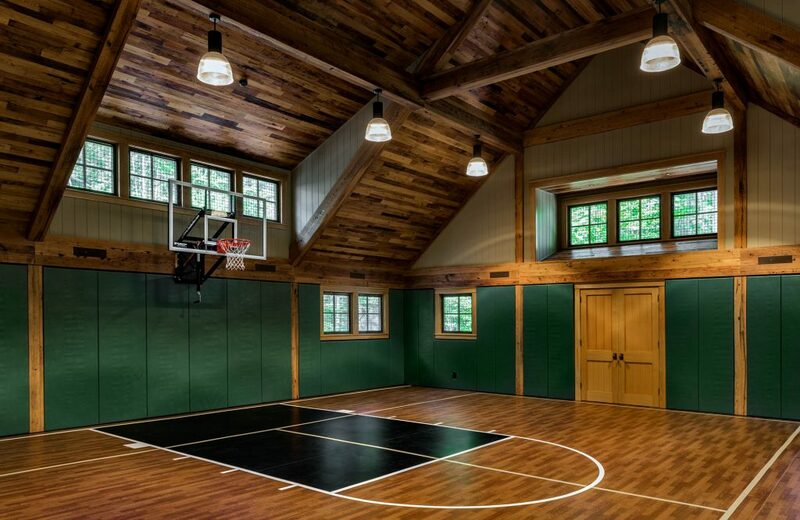 An indoor gym and basketball court offers a fantastic space to play, but the acoustics presented a challenge. We used suspended concrete slab to help reduce the noise throughout the space. In this home, both kids and adults have their own rooms to play. 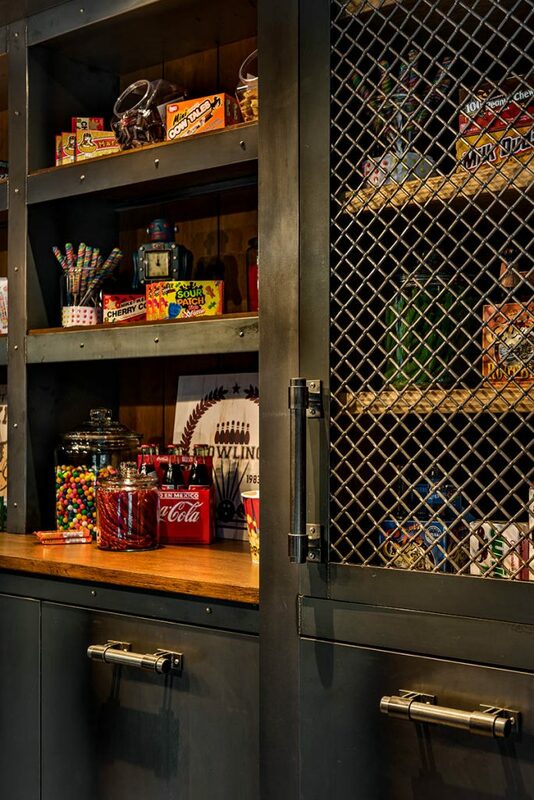 Big kids can run wild with arcade games, ping pong, skee ball and more, while little ones have a separate toddler play area with a built in arts and crafts space and plenty of storage. 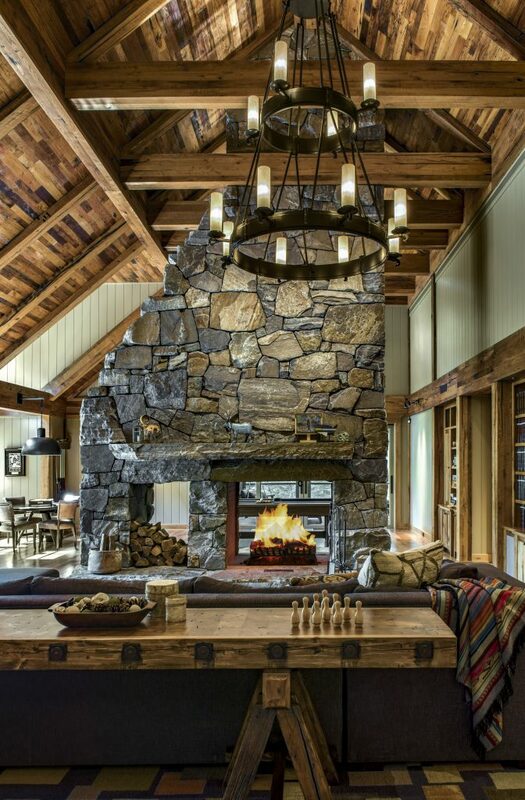 For the adults, a lounge complete with a billiards table, shuffleboard, kitchenette and double-sided fireplace creates an ideal space to kick back and relax. 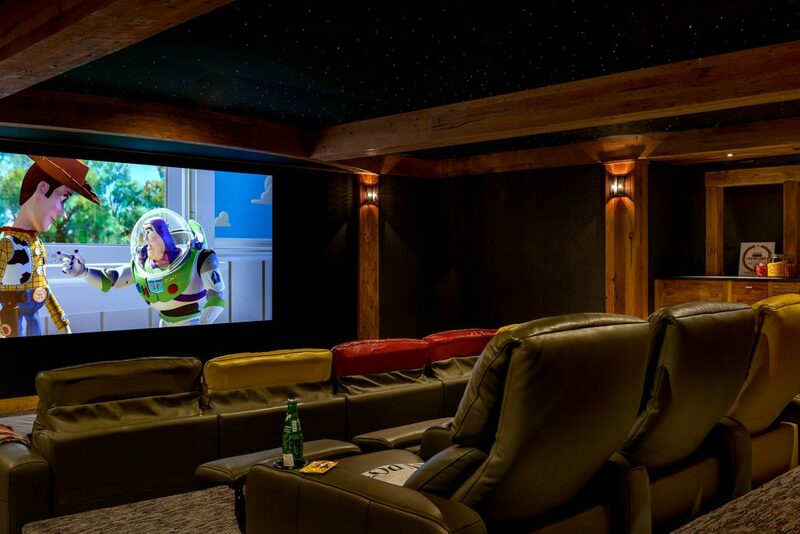 Playhouse guests can spend evenings and rainy days watching movies in style. A state-of-the-art home theater by DC Home Systems allows the whole family to enjoy a full cinematic experience anytime they wish. While this playhouse has no shortage of amenities for summer fun, sometimes the best vacation experiences are the simplest. 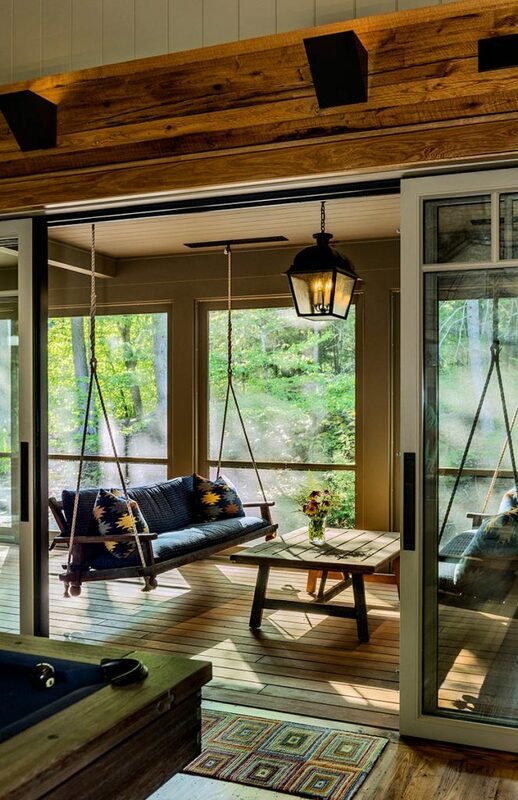 The home’s large entry porch is an ideal place to while away a lazy summer day, and a great room with a cozy fireplace creates a space large enough for everyone to enjoy. Does this playhouse have you dreaming of your own summertime escape? Contact us today to get started on a vacation home that will spark a lifetime of memories.